Poland, OH - MAD 4WD now offers Dana 44 High Steer Arms in 5 different versions. The arms are available in both long and short versions and also with the standard 3 hole configuration mounting or 4 hole to work with Dedenbear steering knuckles. The arms are machined from billet cold rolled steel and are 1" thick. The mounting face of the arms is angled 10 degrees to offset steering joint misalignment. The steering arms come blank, giving the customer the option of drilling or reaming steering link mounting holes themselves or have them come machined from Mad 4WD for an additional fee. This way the arms are not weakened with multiple holes so that they work with a number of applications. 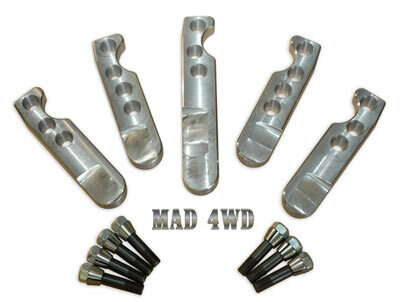 MAD 4WD also offers 4140 chromoly heat treaded stud kits. Located in Poland Ohio, Mad 4wd manufactures a full line of off-road products, specializing in bulletproof custom suspension and drivetrain components. For more information visit their website at www.mad4wd.com or reach them on the phone at 330-549-9082.